Ginger also contains numerous other anti-inflammatory and antioxidant compounds beneficial to health such as gingerols, beta-carotene, capsaicin, caffeic acid, curcumin and salicylate. In my house, we drink lots of ginger and garlic tea made from boiling freshly chopped ginger and garlic whenever it’s cold. Honey is added to sweeten the tea and for additional health benefits. Ginger is commonly used to treat stomach related problems such as morning sickness, colic, upset stomach, gas, diarrhoea, nausea caused by cancer treatment, nausea and vomiting after surgery, as well as loss of appetite. It reduces pain and inflammation, making it valuable in managing arthritis, headaches, and menstrual cramps. It has a warming effect and stimulates circulation. It inhibits rhinovirus, which can cause the common cold. It inhibits bacteria such as salmonella, which causes diarrhoea, and protozoa such as trichomonas. Ginger helps indigestion. The phenolic compounds in ginger are known to help relieve gastrointestinal irritation, stimulate saliva and bile production and suppress gastric contractions and movement of food and fluids through the GI tract. Increasing the consumption of ginger decreases the risk of obesity, diabetes, heart disease and overall mortality while promoting a healthy complexion and hair, increased energy and overall lower weight. 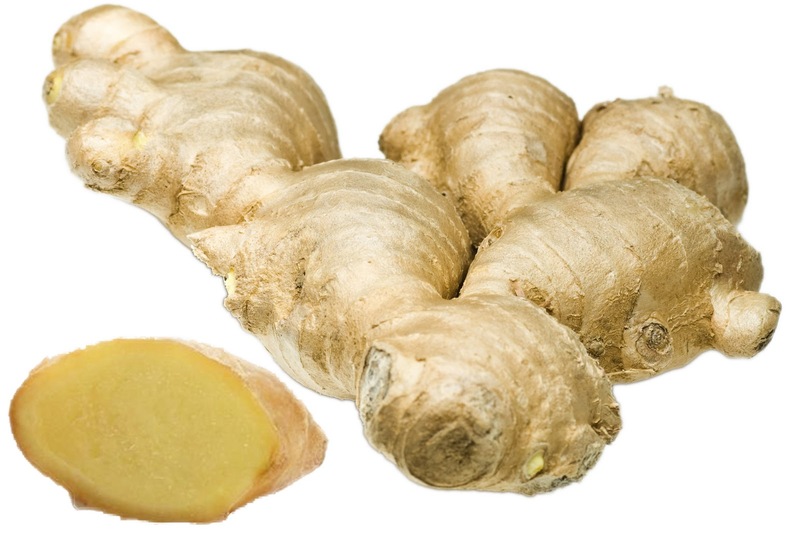 Ginger has also been found to reduce the symptoms of dysmenorrhea (severe pain during a menstrual cycle). Ginger has been used for a to reduce inflammation and treat inflammatory conditions. It is advisable not to take ginger while taking medication. Chew ginger properly to avoid it blocking the intestine.